Congratulations to all our 2018 Winners!! A record 249 players attended this year's SC Scholastic Championships held at the SC State Museum!! Left - playing hall Middle School Section; Center - Clemson Elementary - Elementary Champions!! ; Right - State Champion Alex Byrnes battles Guneteja Guruvelli in the 5th and final round. Congratulations SC Championship Tournament Winners!! Left - Playing hall at the new location - Wingate by Wyndham in Lexington SC; Center - Feeling exhilarated, NM Sam Copeland describes his tournament experience to SCCA President, David Grimaud; Right - Daniel Tanco proudly displays his 2nd Place Trophy in the Open Section! SC Wins Border Battle 2017! Left - Upstairs Tournament Playing Room - Charlotte Chess Center; Right - South Carolina Border Battle Team 2017! Left - Tournament Hall; Center - Blitz Game; Right - Last year's blitz champion Dr. Edsel Pena (right) congratulates Ben Caeillo (new 2017 blitz champ!). 2019 SC Scholastic Championships - Results! 221 excellent young chess players competed in the 2019 South Carolina Scholastic Chess Championship held March 9 at Dent Middle School. Competitors came from communities such as Columbia, Spartanburg, Charleston, Greenville, Simpsonville, Beaufort, Hilton Head, Andersson, Clemson. and ranged from the ages of 4 to 17. The champions in the K-8 (Eli Moore) and K-12 (Matthew Johnson (photo right), Grace Bajarias, and Lefan Xuan) have won the right to represent South Carolina in national competitions against the other state scholastic champions. We are proud to have such fine representatives for our state, and we know they will do all of us proud! NM Mike Sailer Wins 2019 Columbia Open! Congratulations to National Master Mike Sailer of Columbia SC! Mike finished with 4.5 points in the five-round event giving him a clear first place. LM Klaus Pohl (SC) finished second with 4.0 points. Ernest (Gene) Nix, Jr. (SC) and Eli Moore (SC) tied for third with 2.5 points each. There was a three-way tie for the top spot in the U1600 section. Marty Anderson (SC), Brennan Ravan (SC), and Danny Ross Simmons (SC) all finished with 3.5 points each. Fifteen players competed in this year's event held at the Hilton Garden Inn (Feb. 9-10) in Columbia. In a last warm up before this year's SC State Scholastic Championship (March 9th), forty-six competitors met at North Trenholm Baptist Church in Columbia to test their wits over the chess board at the Midlands Scholastic Chess League IV! Our compliments to these talented competitors on a delightful set of games and their excellent sportsmanship. Matthew Johnson wins 45th Snowstorm Special! 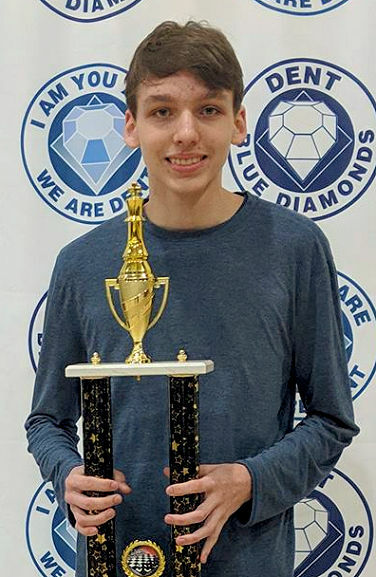 With a perfect 4-0 score, Matthew Johnson won the 45th Snowstorm Special on February 16, 2019, and joins the list of accomplished players who have done the same. 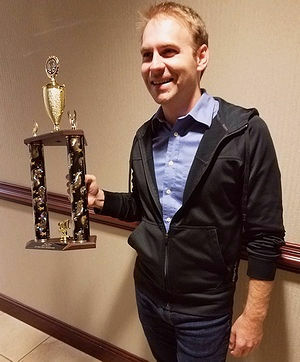 Matthew was the second highest rated player in the tournament, but only had to beat the third highest rated player, Gary Firestone, in the final round to complete his sweep. 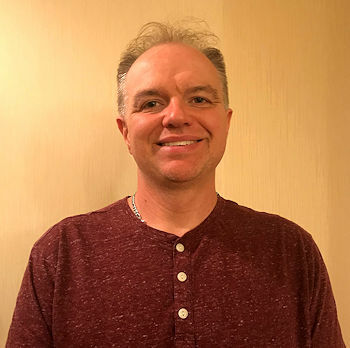 Gary had upset the highest rated player, Ian Barnett, in the 3rd round, which set up the battle of “B” players in the final round for 1st place. Gary and Ian finished 3-1 and shared 2nd place. This year's 45th Snowstorm Special tournament was held at The Church of the Holy Cross Parish Hall, Daniel Island SC. 23 Players from six different states gathered at the Hampton Inn in Greenville, SC (Dec. 15-16) to determine who would be named Senior Champion of South Carolina 2018. At the end of four rounds, the new champion emerged. All hail the Senior Champion of South Carolina, Life Master Klaus Pohl! He drew in the final round with NM Peter Bereolos of Tennessee to score 3.5-0.5 to claim the SC title and trophy in this past weekend’s 10th Annual SC Senior Open!. Expert Peter Michelman of North Carolina shared overall first place, while Ray Downs of Alabama and NM Bereolos shared third and fourth places. John Haymond and Christopher Scarborough led the Under-1600 crowd going into the final round, with John prevailing in their game to earn the U1600 SC title and trophy and first overall U1600 – congratulations! Tony Cato, Christopher Scarborough, and NCCA President Debs Pedigo shared second, third and fourth places among the Under-1600 players. Other Greenville-area contenders were Bill Corbett, Daniel Pollock, Expert Mike Anderson, Dean Creech, Vito Cortese, and Wendell Burnett. Thanks to all who participated, whether they supported chess in their hometown or they crossed several state lines to be in it! Six states were represented, with South Carolina happily forming the majority at 15 players, followed by North Carolina and Georgia with two each, and one each from Tennessee, Alabama, and New Jersey! A record 82 South Carolina chess players competed in the MSCL III: Olympiad tournament hosted by Dent Middle School this Saturday! This was our largest and (in our opinion) most successful Strategery tournament so far. We were happy to see the extensive support for the Olympiad tournament, the only team tournament in South Carolina. 18 teams competed in the Olympiad section. Teams were composed of three players and competition was organized in matches between teams. Individual medals were awarded to those who achieved the best score on their "board" where the highest-rated player on a team played board one and so forth. 28 individuals competed in the Friends and Family section. 1st - Brennan Ravan who scored 4/4 and surged past 1300. 2nd - David Laboone who scored 3.5/4 playing in his first tournament in three decades! =1st U1000 - Jason Huynh, Samuel Hartford, Daryl Dowty Jr. Puzzle Rush contest: Jacob Stoll achieved the best score (27) in our Puzzle Rush contest and won a $20 Amazon gift card. Our immense thanks to Dent Middle School's chess team for their hard work in hosting this event and for graciously welcoming the opposing teams. 4 teams from Dent competed in the Olympiad section, their "silver" and "white" teams tied for first K-8 team. Daniel Smith and Sam Copeland TDed the event and would like to express our appreciation to all for their patience and support. It helped immeasurably in making sure everything ran smoothly. We will be back in spring with more tournaments, more after-school programs, and more chess! In the meantime, every Tuesday we have an online tournament on ChessKid.com at 5 pm, and every Thursday from 6-7 we meet at the Saint Andrews Library for Kid's Hour. NM Mike Sailer Wins 2018 South Carolina State Championship!! Sixty-three players competed in the three-section, five-round, 79th Annual South Carolina State Chess Championship over the weekend, Nov. 2-4. Congratulations to NM Mike Sailer (SC) on winning this year's South Carolina State Championship Tournament!! Mike (right) brings a wealth of North Dakota chess accolades to the Palmetto State having been the North Dakota State Champion an incredible 17 times (various years) from 1990-2011. He is also a member of North Dakota's Chess Hall of Fame! Congratulations also to FM Jorge Leon Oquendo (2499) of Jacksonville, FL on winning the first-place prize in the Open Section with a dominant performance going undefeated after taking a first round bye. Other South Carolina section winners receiving first place trophies included Matthew Grant Johnson 5/5 (perfect score!) in the U1800 Section and Jacob Stoll 4/5 in the U1400 Section. The South Carolina Chess Association would like to thank all players, and spectators who helped make the tournament a success. Special thanks to Daniel Smith and Jordan Anderson for organizing and directing this year's event! Booster U1400: 1st-4th (tbrk) Smayan Ammasani (NC) 4/5 pts. ; Jacob Stoll (SC) 4/5 pts. (T); Billy Willis (SC) 4/5 pts. (T); Dr. Anil V. Yallapragada (SC) 4/5 pts. GM Elshan Moradiabadi goes Undefeated in SC Tour! 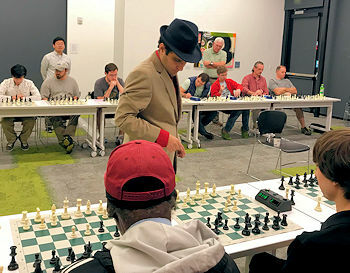 GRANDMASTER ELSHAN MORADIABADI of Durham, North Carolina, completed a four-day tour of South Carolina, winning 60 chess games in four individual simultaneous exhibitions in this traditional, annual, state-wide tour to promote the State Chess Championship in S.C. this weekend (Nov. 2 - 4). Chauffeured by S.C. Chess Association President, David Grimaud, GM Moradiabadi tackled every simul with zeal, even picking up the pace in Columbia when he realized he might be the first tour master to finish with a perfect score. The grandmaster’s toughest game, and the last game standing at the end of the tour, was against NM Mike Sailer who managed to gain an edge in the middle game as Black in the Slav Defense. GM Moradiabadi realized that he and NM Sailer were headed toward a drawn endgame. However, the GM was spurred on to play aggressively, taking some risks in the hope of finishing with his final and 60th win. In time pressure, NM Sailer missed a forced draw by perpetual check. The GM exchanged his queen for rook and bishop to set up a mating threat that won back the queen and brought the final resignation. The GM admitted he had swindled a handful of such games during the tour after making blunders and losing material, showing the resiliency of this young, and ambitious GM. The association would like to thank Precision Tune Auto Care, Roly Poly Sandwiches of Greenville, and Think Move Chess Academy for sponsoring this tour. Special thanks go to Cornel White of Charleston and friends for raising funds online to assist in the expense. Also, thanks goes to the other organizers and promoters that include, but aren’t limited, to the following: Rachel Hequembourg of Roly Poly; Gene Nix and the Greenville Chess Club; David Causey, Dennis Dawley, and the Charleston Chess Club; Daniel Smith and the Columbia Chess Club; David Acosta and Eli Neumann of Think Move Chess Academy. Last, but not least, thanks to NM Sam Copeland of Strategery Chess and Games, and Rod Franco of Richland Memorial Library-St. Andrews Branch for the best venue and setup of the tour. Two Columbians shone brightest as eighteen players fiercely contested the five-round GSSM October Open on October 27, 2018, in Hartsville. Eli Moore and Jordan Anderson shared first place at 4.5, battling to a nailbiter draw in their fourth round meeting. Yes, it was a rook and pawn endgame that wound up drawn! On tiebreakers, Eli took the first place trophy. Other trophy winners were GSSM senior Travis Pence of Fort Mill for Biggest Upset, earned at the expense of Myrtle Beach’s Cecil Clarkson (a 395-point difference), and GSSM junior Theo Pedapolu of Orangeburg for First Unrated. Travis and Theo were among the six players finishing tied for third with 3.0. The other four were GSSM senior Brian Torreon and three GSSM alums, now USC students: Brennan Ravan, Victor Ruan, and Jeffrey Russell. (Had there been a third-place trophy, Travis would have won it on tiebreaks.) Jordan, GSSM c/o 2008, was Chief TD, and Brennan Assistant TD. Midlands Scholastic Chess League I - Roundup! 45 players competed in the Midlands Scholastic Chess League I on October 13! This was our largest season opener in the four years we have been offering tournaments, and we were excited to see intense (friendly) competition in all sections. This year we added several events to our tournament. First, we offered a Q and A on chess competition for parents and a later lesson/Q and A on the rules of chess. During lunch, reigning SC champion Sam Copeland played a seven-board simul scoring seven wins against his young and aggressive opponents. Thanks to all who came out, and we look forward to seeing you next month for the MSCL II on Nov. 10. Let us know what lessons or activities you would like us to include next time! Greenville Fall Scholastic, October 6, 2018! Green Charter Elementary School took the team trophy with a score of 12.5-2.5 among their top three finishers, followed closely by Monarch Elementary School with 11.5. Seventeen youngsters competed in their first regular rated tournament! Sixteen schools wer there, with Green Charter’s 16 contenders enjoying the home-field, Hampton Park Christian’s 11 close behind, and Monarch Elementary’s 8, Clemson Elementary’s 7, and Edwards Middle School’s 7 rounding out the leading participation levels! Greenville Chess Club members, Think Move Chess Academy instructors, Green Charter School officials, and numerous enthusiastic chess parents volunteered to make this operation smoother than a King’s Gambit! These included Hernestina Nix with set up and check-in, Dean Creech as primary assistant TD, Will Brown and Ani Agnihotri as floor TDs, Arati Agnihotri & Neeta Dubey as score-keepers, Aidan Fejzulai as photographer, and David Acosta and Elijah Neumann with TMCA! Sara Hamby with Green Charter provided the venue. Life Master Klaus Pohl assisted with floor TD duties and game analysis. Thanks also to National TD Kevin Hyde for the loan of many chess sets! Finally, warmest thanks go to the parents and guardians who support and encourage their children in learning chess from an early age! Local TD Gene Nix organized and directed. Each year, the Denker, Barber, and NGTOC tournaments take place at the same time and place of the US Open (July 28-31, Marriot West, Middleton WI). This year, for the first time ever, an additional tournament was added to this prestigious trio of events - welcome the National Senior Tournament of Champions! The newly formed NSTOC featured 42 participants each carefully selected by their state’s US Chess Association affiliate. All participants had to be at least 50+ years of age. Congratulations to South Carolina’s first entry into the NSTOC, NM Klaus Pohl of Greenville, SC!! NM Pohl finished 3.5/6 and 18th (of 42) overall. He also won “Top Senior Prize (+75)”!! David Grimaud served as head of US Chess’s National Senior Committee and helped organize the new event. Read more..
South Carolina Denker, Barber, NGTOC representatives this year in Middleton, WI were: Alexander Moreno, Benjamin Webb, and Lefan Xuan. Congratulations to all these fine players!! Alexander finished 27th in the Denker Tournament of HS Champions with a final score of 3.0/6. He also had the honor of singing our National Anthem at the Opening Ceremonies!! Benjamin Webb finished 34th with a final score of 2.5/6 in the Barber K-8 Tournament of Champions while Lefan Xuan finished with 1.5/6 (41st) in the National Girl’s Tournament of Champions. As a team, SC finished 34th with 7.0/18. Greenville Spring Scholastic, May 5, 2018 - Results! K-8 (8 players): Bradon Schley, 4.0; Ford Duncan, Aayush Verma & Sydney Burke, 2.0; Sumukh Paspuleti & Payton Springer, 1.0. Kunal Bakre, Brijesh Abboy & James Robinson, 3.0. William Ngo, Batuhan Tarhan & Silas Hall, 3.0. Twenty-nine youngsters competed in their first regular rated tournament! Twenty-two schools represented, with Green Charter’s 17 contenders enjoying the home-field, and Clemson Elementary’s 17 matching that, along with nine from Hampton Park Christian School, seven from Monarch ES, and five home-schoolers, along with many others. 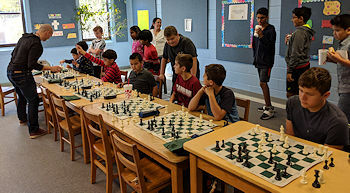 Greenville Chess Club members, Think Move Chess Academy instructors, SC Chess Association representatives, Green Charter School officials, and numerous enthusiastic chess parents volunteered to make this a smooth operation! These included Hernestina Nix with set up and check-in, Andrew Plyler as primary assistant TD, Aidan Fejzulai as floor TD and photographer, Ani Agnihotri & Bhavin Sanghani as assistant floor TDs, Arati Agnihotri & Sarma Robinson with score-keeping and trophy repair, David Grimaud & David Acosta with TMCA, and Elijah Neumann with online pre-registration! Sara Hamby with Green Charter provided the venue and arranged for on-site dining. Thanks also to National TD Kevin Hyde for the loan of many chess sets! Finally, warmest thanks go to the parents and guardians who support and encourage their children in learning chess from an early age! Local TD Gene Nix organized and directed. Midlands Scholastic Chess League VI: Graduation - Results! Thirty-six enterprising young players turned out for the MSCL VI: Graduation on April 28th, competing for themselves and their schools in our final tournament of the 2018 scholastic chess season. It's been incredibly exciting to see these players grow and learn as young chess players throughout the 2017-18 year, many playing their first tournaments and just getting into tournament chess and some establishing themselves as the best players of their age group in the state and the country. Congratulations to James MacDougall (2018 SC Rapid Champion), Sam Copeland (2018 SC Blitz Champion), Pradhyumna Kothapalli and Klaus Pohl (Bughouse Champions)! James MacDougall scored 7.5/9 in the rapid championship to score an undefeated clear first. Klaus Pohl and reigning SC high school champion Alex Byrne shared second with 7/9. Sam Copeland was clear fourth place and newly minted Dr. Rade Musulin was fifth place. Eli Moore and Andrew Bouman shared first U1600 and George Harrison Jr. and Stephen Lentz shared first U1200. Pradhyumna Kothapalli and Sam Copeland scored 14/18 to win the blitz section with Copeland gaining the SC blitz champion title as Kothapalli is an NC resident. Randal Ferguson finished in clear third. Rade Musulin finished clear fourth, and Alex Byrne finished clear fifth. Eli Moore and Daniel Smith shared first U1600 while Jacob Stoll was clear first U1200. After a playoff, Klaus Pohl and Pradhyumna Kothapalli won the bughouse championship ahead of Sam Copeland and Vincent Mahoney-Harvey and James Macdougall and Brandon Jordan after all scored 4/5. Alex Byrne and Eli Moore won the U18 bughouse trophy. Special thanks to NM Sam Copeland (Strategery Chess & Games) and VP Daniel M. Smith for organizing and directing this year's event! NM Sam Copeland expertly analyzes the final round game of the SC State Scholastic Championship Tournament (HS section). This game was between newcomer (and eventual 1st place winner) Alex Byrne and Teja Guruvelli. Both players gave it their all in a game that opened with the King's Gambit Accepted - an exciting reminder of the Romantic era of chess! Midlands Scholastic Chess League V: Brilliancies - Results! On Saturday, March 24th, the top seeds defended their pride in the Midlands Scholastic Chess League V tournament held at North Trenholm Baptist Church! Congratulations to all of these fierce competitors on an exciting slate of games! The best game prize went to Jacob Stoll for his queen sac! The best game prize was awarded to Daryl Dowty and William Bao for their third round draw. The brilliancy prize was awarded to Ruien Lyu for his first-round game. Midlands Scholastic Chess League IV: Championship Training - Results! Two of its representatives held the Columbia Chess Club’s banner high at the GSSM January Open in Hartsville on January 13, 2018. Robert Halliday earned clear first place with 5.0, with Eli Moore clear second at 4.0, losing only to Halliday in a tough struggle. As Halliday subsequently put it, “Yes, indeed, I did earn this money!” Jordan Anderson, Cecil Clarkson, Brennan Ravan, James Balmediano and Jeffrey Russell finished tied for third with 3.0 in the fourteen-player field. Anderson, also of Columbia, directed the tournament, assisted by Ravan. Nineteen venerable gentlemen from South Carolina, North Carolina, Georgia, Tennessee, Alabama, and Virginia converged on the Hampton Inn at I-385 in Greenville, SC, to resolve the matter of senior dominance at the chess board in South Carolina! Accelerated pairings left only two perfect 2-0 scores going into the Sunday rounds, setting the pieces for a Master-level showdown in the final round between leader Life Master Peter Bereolos of Tennessee, and South Carolina legend Life Master Klaus Pohl. The Tennessee Master finally prevailed for the tournament win, while Daniel Quigley won a ratings upset over past NC Senior Champion Michael Kliber two boards down to take the SC Senior Championship trophy and title, and to share second & third places with Dr. Clark Brown of Georgia! The U1600 leaders finished with a five-way tie at 2-2, with Michael Meekins taking the SC U1600 Senior trophy, which award was established on-site and which object is on order for delivery forthwith! The contending field included also from South Carolina John Haymond (returning to competition this year after a too long break), Lee Marinelli and Dean Creech; and from North Carolina Michael Matson, Joseph Quinlan, Wayne Spon, Bruce Roth, Debs Pedigo, Mike Eberhardinger, and Harold Zeltner; and Ray Downs from Alabama; and Steven Boshears from Georgia, and from Virginia was Rob Mahan, a fellow organizer of Senior tournaments! South Carolina Senior Champion Daniel Quigley will receive an invitation and a stipend to compete in the Tournament of Senior State Champions next July in Madison, Wisconsin, alongside the US Open, to include a half-off entry into the US Open itself afterward. The development of this new event derives from SCCA President David Grimaud’s work as the US Chess Senior Committee President! Warmest thanks go to the staff of the Hampton Inn for their responsive service, and to Business Manager Ms. Jessica Dillard for her close management of guest room matters. Special thanks go to Mr. Grimaud and Precision Tune Auto Care for their generous sponsorship of this and other SC tournaments, and to some unnamed, anonymous, and undisclosed donors who added funds to augment the U1600 prizes, to include an Under-1600 SC trophy!. Local TD Gene Nix organized and officiated. Midlands Scholastic Chess League III Olympiad! Results! Our first ever true team tournament, the MSCL Olympiad, was our largest tournament thus far! 69 players from all over the state of South Carolina participated, many braving snow to make the trip. The event was held Saturday, Dec. 9th at Heathwood Hall in Columbia. 15 teams of 3 players (plus alternates) organized by school participated in the Olympiad section. In the Friends and Family section, we had 19 players. Daryl Dowty the elder won all 4 games to claim first place and $50. In a big tie for second were Warren Sampson, Will Tabakian, Jay Nelson, and Daryl Dowty the younger. Each received $20 and Will, Jay, and Daryl claimed the 1st, 2nd, and 3rd place junior trophies respectively. Midlands Scholastic Chess League II: David Vs. Goliath - Results! Our "Davids" who defeated higher-rated Goliaths were Jennifer Bailey, Warren Sampson, Ben Sloop, Calvin Smith, Grace Bajarias, Kameron Belk, Samantha Wilmott, Ethan Maldonado, Kevin Reeves, and Zarif Ula. NM Sam Copeland Wins 2017 South Carolina State Championship! Fifty-eight p layers from six different states competed in this year's three-section, five-round, 78th Annual South Carolina State Chess Championship over the weekend (Oct. 14-15) at the Wingate by Wyndam in Lexington SC. Congratulations to NM Sam Copeland!!! After an early disappointing first round lost, National Master Copeland rallied to win his next four games thereby claiming the SC State Championship Title for 2017!!! In his 5th and final round, NM Copeland played the Evan's Gambit (accepted) and found great success after an especially powerful move 16. Ne5! His opponent resigned shortly thereafter. It was a fitting end to a comeback story and one that will be remembered for quite some time (see this game below). Other South Carolina section winners receiving first place trophies included Harsha Srijay (4.0/5), winner of the U1900 Section, and Robert Webb (4.5/5), winner of the U1500 Section. The South Carolina Chess Association would like to thank all players, and spectators who helped make the tournament a success. Special thanks to Daniel Smith, David Grimaud, and David Causey for organizing and directing this year's event! Pictures and more to follow. Congratulations to all of our 2017 Winners!! Senior Open Section Winner - Keith Eubanks 2.5/5 pts. (1st place-tie): (NC) Prad Kothapalli 4.0/5 pts., (SC) Harsha Srijay (T) 4.0/5 pts., (3rd place - tie) (NC) Advaith Karthik 3.5/5 pts. ; (SC) Benjamin Webb (T) 3.5/5 points. U1700:(2nd place-tie) (SC) Eli Davis Moore 3.0/5 pts. ; (SC) Rashad Ishmael 3.0/5 pts. Senior U1900 Section Winner - (SC) John Yates (T) 3.0/5 pts. (1st) (SC) Robert B Webb III (T) 4.5/5 pts. ; (2nd) (SC) Zach Walsh (T) 4.0/5 pts. (3rd-tie) (SC) Mike Meekins, (SC) Andrew Bouman, (SC) John Roberts, (MD) Kyle Schaff - all with 3.5/5 pts each. The Midlands Scholastic Chess League started Saturday (October 7th) with 43 players turning out to hone their chess skills in friendly competition. In a tournament dedicated to newcomers, 10 players tried their hand at their first tournaments This year, we added a primary section for the first time. Many young players tried this section for the first time, demonstrating impressive mastery of chess for their young years .In all of the higher sections, some of the most impressive results were turned in by players playing up in higher sections! Particularly impressive was 7-year-old Smayan Ammasani's 2nd place finish in the K-8 section! GSSM September Open Results! Three trophies, three Govies! Three trophies were awarded at the five-round GSSM September Open in Hartsville on September 30, and Govies (GSSM students) won them all, although Govies comprised only about half of the field. First place went to Richard Sandvoss on tie-breaks over GSSM alum Jordan Anderson of Columbia (c/o '08). Each ended the day with 4.5 points of the possible five, having fought to a draw in round three. The trophy for biggest upset went to Victor Ruan, who upended Brennan Ravan although Brennan entered the day rated considerably higher. The trophy for first unrated was earned by Brian Torreon, with 3.0 points on the day. Greenville Fall Scholastic 2017 Results! Twenty-nine youngsters competed in their first or second rated tournament! Green Charter School and Edwards MS were represented by 11 players each, and Clemson Elementary with 10. Woodruff HS, Sterling School, Lexington HS, Langston Charter, Hillcrest MS, Riverside HS, New Covenant, Chapin Intermediate, St Paul’s, Pelham Road ES, Brushy Creek ES, Monarch ES, Spartanburg Prep, Midlands Institute, Bob Jones HS, New Covenant, Hillcrest MS, Dent MS, Chapin Intermediate, and various home schools were all well represented. Greenville Chess Club members acted as floor TDs: Dean Creech, Dr. Wayne Goddard, Life Master Klaus Pohl, Will Brown, and Tim Rankin. Strong-back help with set-up and take-down came from Mark Webb, Klaus Pohl, Dr. Goddard, and many others. Special thanks to the staff of Eastlan Baptist Church for their kind attention to the venue and for their support of numerous chess events, to Kevin Hyde for the use of the chess sets, and to Clemson ES Chess Club for additional chess clocks. The enthusiastic surge of chess in local elementary schools owes largely to the promotional efforts of Mr. Doug Peterson and to the Think-Move chess initiative of Peter Giannatos and David Grimaud. Precision Tune Auto Care and David Grimaud, CEO, sponsored GSS’17 – thank you! Finally, thanks go to the parents and guardians who support and encourage their children in learning chess from an early age! Local TD Gene Nix organized and directed. South Carolina Wins 2017 Border Battle!! The annual battle for border supremacy between North and South Carolina concluded Sunday with Team SC winning the overall match by a final score of 39.5 - 29.5!! This year's event, held at the Charlotte Chess Center & Scholastic Academy (Aug. 19-20), featured three new sections (High School, State Championship, and "C ALT"). The additional "C" section was added to accommodate the growing number of interested players rated between 1400-1599 USCF. In the State Championship section, (SC Champ) Ben Caiello (2145) played four rounds against (NC) NM Tianqi Wang (2383) - both players finished with 2/4 pts. In the High School Section, Michael Burrell (SC Scholastic Champ) scored 2.5/4 points. In the Expert section, Elijah Neumann finished with 3/4 pts. In section C, Eli Moore finished with 3/4 pts. In section "C ALT", Matthew Grant Johnson had the only perfect score - 4/4 pts! This was an exciting, competitive, and fun event that is growing in popularity! Congratulations again to all our fine players!! Special thanks to NM Peter Gianattos and the Charlotte Chess Center for hosting again this year! Thank you parents for making the trip to Charlotte and supporting chess in South Carolina!! See crosstables for more scores. Congratulations to our three SC representatives, Michael Burrell (SC Scholastic Champ 2017), Benjamin Webb, and Olivia Watkins for their courageous performances in the prestigious Denker/Barber/NGTOC Chess Tournaments held at the Sheraton Norfolk Waterside Hotel in Norfolk Virginia July 29th - August 1st!! It takes talent, huge effort, and great family support to arrive at this level and these kids represented us well!! Special thanks also to all those who contributed financially to help make the trip to Norfolk possible and to all the players, and families of players for their steadfast support of chess in South Carolina!! Midlands Scholastic Chess League VI Results! An impressive cadre of 53 players from all around the state played Sat. May 13th, 2017 in the Midlands Scholastic Chess League VI to wrap up the spring semester. Congratulations to Harsha Srijay and Alex Tabakian, David Dye, and Daryl Dowty and Smayan Ammasani on winning the K-12, K-8, and K-5 sections respectively. Our team champions were Scholar's Academy, Laing Middle School, and Lake Murray Elementary School. Thanks to all who came out and we hope to see you again in fall! Greenville Spring Scholastic 2017 Results! 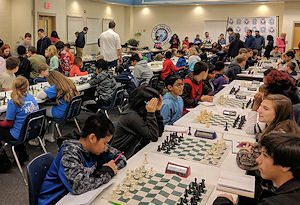 Thirty-three youngsters competed in their first rated tournament, with Green Charter School appearing in force with 18 players, and Clemson Elementary with 13. Sterling School, Lexington HS, Edwards MS, Charleston Catholic, Midlands, Hampton Park Christian, Langston Charter, Hillcrest MS, Riverside MS, Barringer Academic Center, New Covenant, Chapin Intermediate, St Paul’s, St. Mary’s, St. John’s, Shannon Forest Christian, Pelham Road ES, Metrolina Regional, Byrd ES, Hampton Park Charter, Sara Collins ES, and various home schools were all well represented. Greenville Chess Club members acted as floor TDs: Life Master Klaus Pohl, Will Brown, Dean Creech, Dr. Wayne Goddard, and Petar Jotev. Strong-back help with set-up and take-down came from Klaus Pohl, Dr. Goddard, Wendell Burnett, Marlana Burrell, Michael Burrell, David & Rachel & Toby Cox and others. Administrative support and traffic direction came from Ms. Nesha Dias. Special thanks go to the staff of Eastlan Baptist Church for their kind attention to the venue and for their support of numerous chess events, to Kevin Hyde for the use of the chess sets, and to Derek Wilmott for providing additional chess clocks. The enthusiastic surge of chess in local elementary schools is owes largely to the promotional efforts of Mr. Doug Peterson. Precision Tune Auto Care and David Grimaud, CEO, sponsored GSS’17 – thank you! Finally, thanks go to the parents and guardians who support and encourage their children in learning chess from a early age! Local TD Gene Nix organized and directed. Midland's Scholastic Chess League V Results! The MSCL V was probably our strongest scholastic tournament thus far by average rating. Many of the twenty two players competing were previous tournament victors. This month we held a bughouse tournament after the tournament and had 9 teams compete including several parent/child teams that were really fun to watch! Our bughouse champions were Ben Yordy and Charlie Allemond. Our individual victors were Will Tabakian, Alex Tabakian, and Charlie Allemond in K-5, K-8, and K-12 respectively. The winning teams in K-5 and K-8 were Harbison West Elemantary and Midlands STEM Institute. Thanks to Pelion High School for hosting and for all the many times they have hosted! 19 talented young South Carolina players from Columbia, Aiken, and Clemson competed in the Midlands Girls' Chess Tournament held at North Trenholm Baptist Church on Saturday, March 18th, 2017. It is one of our favorite tournaments of the year. There was great competition this year with many players and four teams. About 1/3 of the players were playing in their first tournament. The winners this year are Alesha Dzikowski (1st K-5) and Olivia Watkins and Haylee Hollis (=2nd K-5), Taylor Hollis (1st K-8 and the only perfect score) and Erica Smith (2nd K-8) and Lydia Tillman (1st K-12). The winning team was Midlands Stem Institute followed by Byrd Elementary and the Knights of the Square Table in second and third. Congratulations to all of the competitors, and thanks to Susan Key for assistance with the event! Lefan Xuan Wins The "Tori", the SCCA's Newest Award! Midlands Scholastic Chess League IV - Results! 66 of South Carolina's young chess players competed in the Midlands Scholastic Chess League IV on Saturday, February 4th. Gregory Post won the K-12 section with 3.5 points. Taylor Hollis, Henri Murthy, and Jacob Stoll each got 3 points in the K-8 section, and Jacob Kinard and Calvin Smith each got a perfect score in the K-5 section with Jacob winning a tiebreak game. Pelion High, Midlands STEM, and Harbison West won the K-12, K-8, and K-5 team sections respectively. Thanks to all of these players for their fighting chess and good sportsmanship which kept the spectators riveted! 12th Annual Patrick D. Hart Memorial Scholastic Results! The 12th Annual Patrick D. Hart Memorial Scholastic took place January 21st, 2017 at the Church of the Holy Cross in Daniel Island, SC. Congratulations to K-12 winners Matthew Johnson and David Dye Jr. (first runner-up)! Both players finished with 3.5/4 pts. Matthew Johnson won the 1st place trophy on tiebreak. Eli Moore came in 3rd place with 3.0/4 pts. In K-8, 1st place went to Matthew Stewart with a perfect 4.0/4 score! Devin Dietrich and Hudson Seifert won 2nd and 3rd respectively with Devin winning 2nd place on tiebreak. Both players finished with 3.0/4 pts. K-5 and K-3 sections were combined. Daniel Hartford came in 1st place in K-5 with a perfect 4.0/4 score! Lula Robyn Galvan came in 2nd place with 3.0/4 pts., Matthew Doty came in 3rd place with 2.0/4 pts. In K-3, Jessica Smith came in 1st place with 1.5/4 pts., Vera Galvan came in 2nd place with 1.0/4 pts., Penelope Galvan came in 3rd place with 0.5/4 pts. Congratulations to all the winners!! On Saturday, January 14, twenty-nine players competed in the five-round GSSM January Open on the campus of the Governor’s School for Science and Mathematics in Hartsville. When the proverbial dust settled, three players shared the top spot with hard-earned 4.0 scores: Ian Haigler of Wingate, NC, Jordan Anderson of Columbia, and GSSM senior Jeffrey Russell of York. Jeffrey had entered play as the fourteenth seed; this was his second rated tournament, Ian's 897th, and Jordan's 90th. Jordan, a GSSM alum, served as Chief TD, ably assisted by GSSM junior Brennan Ravan of Columbia. Congratulations NM Sam Copeland and Benjamin Caiello, 2016 Columbia Open Co-Champions!!! 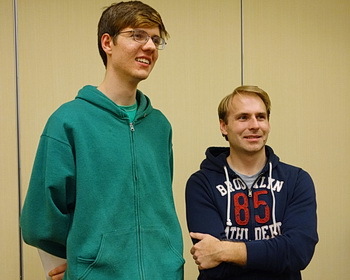 National Master Sam Copeland and Benjamin Caiello (L-R in photo) were named Co-Champions in the 2016 Columbia Open chess tournament held November 19th-20th at the Hilton Garden Inn in Columbia SC. Sam and Ben scored 4.0 points each - splitting this year's top prize! Congratulations also to LM Klaus Pohl! Klaus came in third with a final score of 3.5 points. In the fifth and final round, Klaus played Sam in a grueling game that lasted over 4.5 hours w/100+ moves! You can see this game in PGN format below. U2000 Section: 1st - Gene Nix (3.0 pts) Congrats!! There were a total of 38 players in three sections in this year's event. We would like to thank each and everyone who came either to play or support family members playing in this year's event! Your attendance was greatly appreciated and we would love to see everyone back again next year! Special thanks SCCA Vice Pres. Daniel Smith for directing and coordinating this year's event! Thanks also to Andrew Plyler for providing DGT Board & web support. Thank you Gene Nix for always being there and supporting us! This event was sponsored in part by Precision Tune Auto Care! Midlands Scholastic Chess League I - Results! Over forty players attended this year's first Midlands Scholastic Chess League event held at North Trenholm Baptist Church in Columbia, October 22nd. 2016's first event of the year was a real nailbiter with several exciting finishes occurring in key last round games. Paul Pena eeked out a thrilling win against Eli Moore to win the K-12 section while dozens of spectators gathered. Meanwhile both the K-8 and K-5 sections saw last round upsets as Henri Murthy upset top seed Daniel Sobel to take first in K-8 while Ethan Harder did the same to top seed Daryl Dowty in the K-5. In the team sections, Pelion High claimed K-12, MSI claimed K-8, and CIS leapfrogged MSI in the last round to take top honors in K-5. Here are the full results. Thanks to all for coming out! Our next tournament is November 12th at Pelion High School! We hope to see you there :) Registration is already open at https://goo.gl/forms/reQOeErrsTxJvc2h1. Olivia Watkins scored 3.5/4, achieving the highest score in the Midlands Girls' Tournament and claiming first place K-5! Neha Dias, SC's highest rated female, scored 3.0/4 and claimed top K-12 honors. The sensation of the event was Olivia Watkins catching Neha in a trap when Neha captured a hanging piece, but allowed mate in two. Full awards are as follows. After the event, Neha Dias played six players in a clock simul. She won all six games. The last to succumb was Olivia Watkins as the specter of a bishop and knight mate hovered in the air. We look forward to hosting the event again next year. Thanks enormously to Nisha Dias for representing the USCF Women's Committee and to Maureen Grimaud for help in promoting the event! Twenty-five elder fighters from South Carolina, North Carolina, Georgia, and Tennessee converged on the Hilton Garden Inn hotel in Greenville, SC, to resolve the matter of senior dominance at the chess board. Accelerated pairings left only four perfect scores going into the Sunday rounds, and after sitting next to each other on boards one and two all weekend, Masters Klaus Pohl and Randal Ferguson settled the question in round four in an exciting duel that kept the TD studying tie-break scenarios until Klaus took over the position. So, Life Master Klaus Pohl took first place with 4-0; Expert Mike Anderson was second with 3.5 points; Gary Newsom and Ralph Lombard shared third-fourth with 3 points; National TD Kevin Hyde’s 3-1 took top honors for the Under-1600 prize, and Harold Zeltner won second Under-1600 with two points. We had some new faces, so to speak, with Father Jeffrey Kendall of Round O, SC, and Joe Page of Morrisville, NC, playing in their first rated tournament - welcome to the fray!. Special thanks to Kevin Hyde for sharing his expertise on several finer points of tournament direction. Local TD Gene Nix officiated. Midlands Scholastic Chess League IV Results! In possibly our most competitive tournament yet, we had 40 of the Midlands best and brightest chess players compete across three sections. Thanks to Rade Musulin and Daniel Smith for assisting with direction and to the parents and coaches who support their chess players! In the Adult section, James MacDougall claimed first with a perfect score. Michael Mayfield took second and Charles Stevenson and Truman Price shared third. Thanks to all, and we hope to see you again on May 14th for the MSCL V at Pelion High School! Midlands Scholastic Chess League III Results! Highest Attendance in League Series! 1st Team K-12 - Charles Pinckney Elementary and Pelion High School tied with CPE having the better tiebreak. 1st Team K-5 - Midlands STEM Institute. Congratulations to McKenzie England, Jericho Ho, Omar Hamdan, Blake Lawson, Daniel Sobel, Kevin Reeves, Messiah Cornelius, Matty Ferrario, Katie Maldonado, and Taylor Hollis on being projected to gain more than 100 rating points! We hope to see you at the SC State Scholastic Championships on February 27th in Charleston, SC! Our next tournament will be April 9th at Ashland United Methodist Church; registration will be available this week!